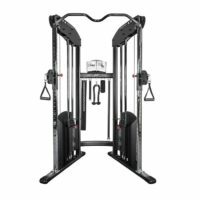 The compact and space efficient MP3.0 TRUE Paramount 3 WEIGHT STACK / 4 STATION GYM includes an Adjustable Cable Column and accommodates 3 trainers on 4 workout stations for a comprehensive full body workout. TRUE Paramount is a leading manufacturer of over 100 commercial fitness products including Functional Trainers, Selectorized Machines, Plate Loaded/Free Weights, Modular Systems, and Multi-Station Gyms. MP SERIES weight stacks. Offering modern styling and optimum function, the MP Series represents the best value-priced two, three, and four stack multi-purpose units on the market today. 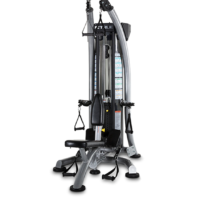 With commercial quality construction and proper biomechanics, MP is the perfect choice for hotels and resorts, corporate fitness centers, police and fire agencies, apartment and condominium complexes, and the residential market. 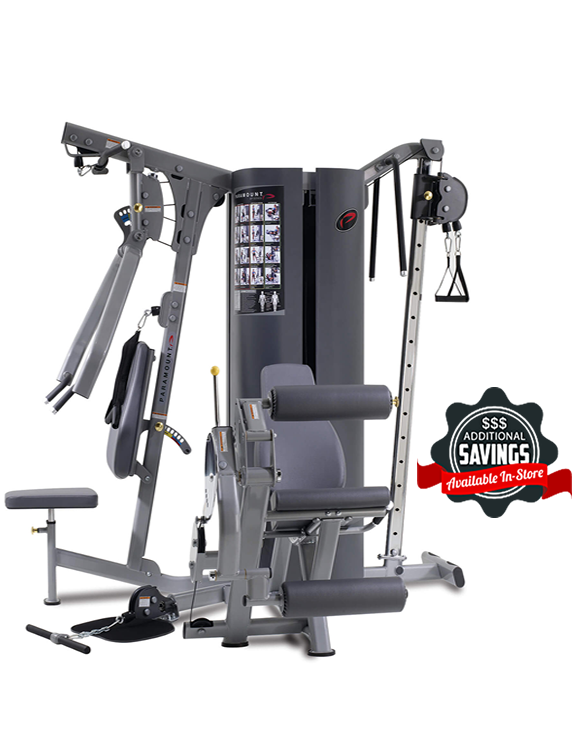 The MP3.0 includes 3 weight stacks and 4 workout stations. 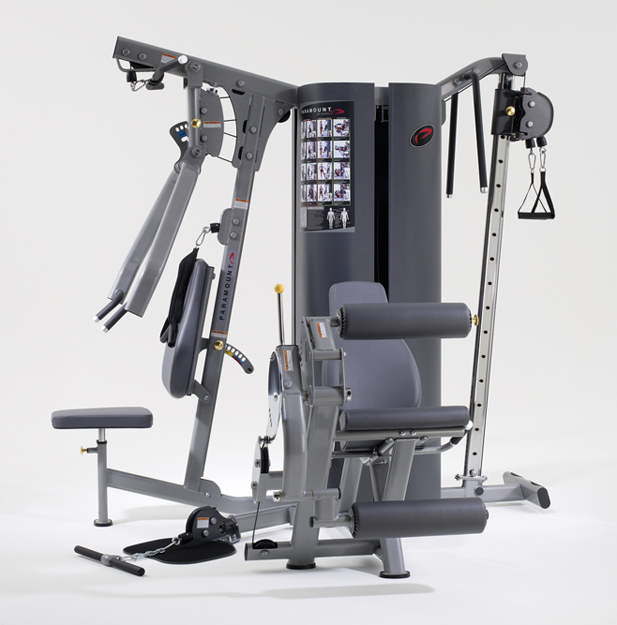 Dual pulleys pivot freely allowing user defined movements. Unilateral cable design accommodates both fitness and athletic style movements with up to 12’ of cable travel with one arm and 6’ of cable travel with both arms. 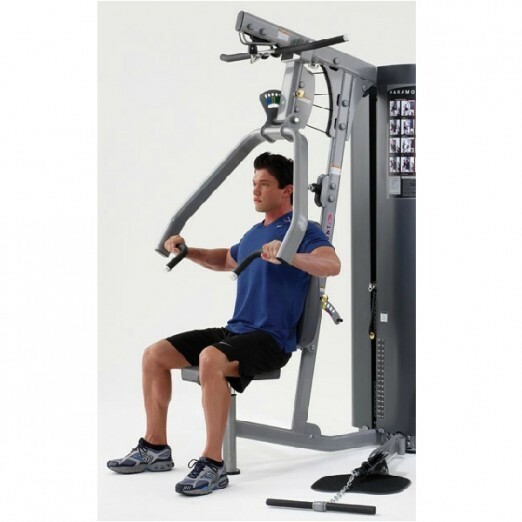 Step-by-Step Instructions • Color-coded, large scale label includes easy-to-follow user instructions, beginning and ending exercise positions, anatomical charts for muscles reference, and recommended maintenance schedule. Rear printed on non-fade washable Lexan material. Structural Frame• Modern styling and structural reliability through the use of 40mm x 80mm and 50mm x 100mm oval shaped tube and precision laser cut steel plate components. 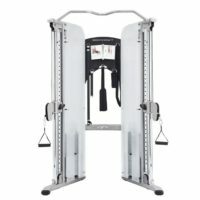 Exercise Position Labels • Color-coded labels indicate proper adjustment-positions for quick and easy user reference. Adjustments • Color-coded adjustment knobs provide quick and easy user reference, enhance aesthetics and eliminate corrosion. Positive locking adjustments use permanently enclosed compression spring for maximum security. Custom Handgrips • Extruded thermo rubber compound handgrips provide durability and comfort. Custom Molded Feet • Located under the base frame to insure stability and prevent marring of floor surfaces. Cables • US made mil-spec lubricated 1/8″ cable nylon coated to 3/16″, with a 2,000 lbs. tensile strength and swaged ball fitting and 5/8″ threaded bolt tension adjustment for maximum durability. Selector Shaft Assembly • Cold rolled solid 1″ selector shaft, chrome-plated for durability and appearance. Machined bullet tip insures proper weight stack entry. Custom designed cap plate with fitted bushings insures low-friction movement of weight plates over guide rods. Receptacle integrated into cap plate provides selector pin storage when user desires zero weight plates. Pulleys • Fiberglass™ reinforced pulleys with deep V-grooved channel provide secure cable seating and optimum bearing rotation. Sealed ball bearings insure smooth and quiet pulley operation. Weight Stack • Choice of 10-lb. or optional 15-lb. increment machined weight plates, 1″ thick with fitted nylon bushings to assure smooth travel on guide rods. Heavy-Duty Selector Pin • Magnetic selector pin assures positive locking to plates and is secured to the weight stack with a thick plastic-coated elastic cable. Axles and Ball Bearings • 1″ Solid steel pivot axles with lubricated 25mm sealed bearings encased in steel housings for frictionless movement and precision alignment of pivots. Weight Stack Enclosure • Heavy-duty 16-gauge steel panels enclose weight stacks for safety and aesthetics. Each panel can be easily removed when necessary. Axles and Ball Bearings • Electrostatically applied powder coat finish enhances appearance and durability. Frame color is Silver. Shroud is painted Storm Grey. 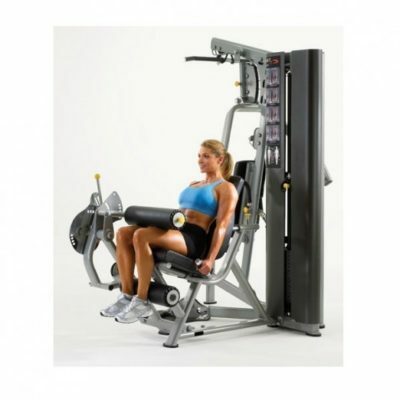 Weight plates are black. Upholstered Pads • Superior-grade Grey upholstery stitched over high density foam with 3/4″ CDX plywood.